It’s great to see two more of our Premium Pubs have taken advantage of our new Pub Events System this week. The tradition of brewing speciality beers for weddings still continues to this day, some of Brtiains top brewers have been (milking the merchandise teat?) producing some commemorative masterpieces; Castle Rock – Kiss me Kate, Fullers Brewery – Royal Wedding Celebration Ale, Burnley Brewery – Royal Appointment Ale, BrewDog Brewery – Royal Virility Performance, Windsor & Eton Brewery – Windsor Knot, Admans – Royal Wedding Ale. If you know of anymore Royal Wedding ales that haven’t made this list do let us know with a comment please. If you are in the vicinity of Westminster Abbey tomorrow you might want to quench your thirst at the St. Stephens Tavern, a charming Olde English style pub with a 125 year history as a public house, puff your chest out a stand proud amongst the tourists, Winston Churchill and Harold MacMillan are said to be a few of the famous to have enjoyed a pint from this taverns taps. Or, you might want to try The Feathers, with plenty of cask ales on offer you’re sure to find something that takes your fancy, just don’t get too rowdy – you’re on Scotland Yards doorstep here. Slightly further out but well worth the walk is The Albert, take a moment to step back and look up at this building, it’s a classic piece of Great British architectural history nestled amongst a sprawling high rise city, some cask ales and bitters on offer at this popular tourist pub. If you really fancy something different, stroll up the Embankment and try the Tattershall Castle, the pub aboard a lovely old steam boat moored on the Thames, used as a tether for barrage balloons during the second world war the Tattershall Castle now boasts a lively restaurant and pub, with some wonderful views of London by the Thames, just remember to take a jacket as the weather for tomorrow is looking choppy! You might want to also consider a bolt hole from the crowds in The Sanctuary House with first class Fullers on tap (will they stock Royal Wedding Celebration Ale? Likely!) This is a popular after work pub, but one to note if the clouds do indeed open upon London tomorrow. 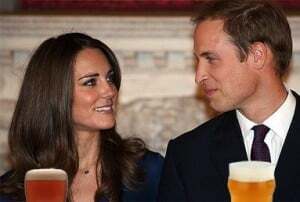 So it’s good luck to William Wales and Kate Middleton for their big day tomorrow at Westminster Abbey, remember to raise a glass in their honour, whatever your verdict on wedding, there is no reason not to wish two people in love the very best that life can offer, cheers! Hello! For those of you that didn’t take advantage of booking these three days off this week and taking a nice eleven day holiday, you might have noticed we have made some fairly radical changes to the beerintheevening.com website. Later this year we’ll be launching new look profile pages and a brand new review system for all the pubs. We’re doing this in stages though instead of one massive change overnight, this is due to the fact BITE is so big – there is a lot to change! So, in this first major change we’ve totally removed the lefthand menu on every page and you’ll now find the most accessed links at the bottom of every page in a nice clear to read format (just like the bottom of this blog posting). You’ll also find that the pub pages now load a lot quicker since we removed the menu and also some extra adverts that were just cluttering up the pages. The top of every page will be changing to our new look over the fortnight with a new menu system allowing you quick access to My BITE, Pub Search and so on. After that we have a couple of new features to launch and then the new profile pages will go live, along with our booking system hopefully in mid-July. 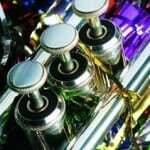 Followed by a host of new features in the Autumn. As always, we welcome any comments on these changes. If you are on holiday though currently, enjoy the sunshine and try and find a nice country pub with a good beer garden! I found this seasonal ale in the Brown Jug (Cheltenham). Last year (2010) the landlord of the Brown Jug made it a local mission to celebrate St. Georges Day. The pub decked out in St. George’s cross bunting, only served traditional English food (Chicken Tikka Masala?) the landlord himself getting into the spirit of things and wearing a suit of armour behind the bar. The Brown Jug served St. George and the Dragon then in 2010, and it continues the tradition this year by restocking it. A seasonal ale only available during March and April, I guess I was lucky to get hold of a few pints before it went into hiding again. Brewed by Wadworth Norgate Brewery with a 4.5% ABV it’s certainly got the firey look about it as described by Wadworths themselves. Very bitter first few sips, thirst quenching in fact, with a strong malty taste, followed by the sharp citrus hops after-taste which gives it some kick, half way into the pint things mellowed out (or perhaps the alchohol numbed the taste buds), I have to say I was sad to see the head go flat which for me is always a soother against the sharpness. The after taste is quite potent and heavy on the palette so do not drink this and try to chat up women, at least not without stuffing mints into your mouth, and if you do that you may as well move onto fizz-kegs as your real ale tasting night is through. That aside, I did stick with it for the night, topping up 3 more pints with this patron saint of beers. Is your pub celebrating St. Georges Day on the Saturday 23rd? 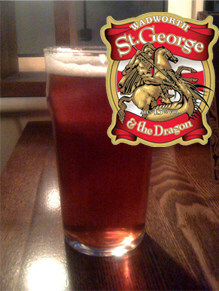 Have you drunk a pint of St. George and the Dragon? Don’t forget to leave your comments! We’re already on Facebook and Twitter. Now we’re on Foursquare! Foursquare gives you & your friends new ways to explore your city. Earn points & unlock badges for discovering new things! Foursquare is available on the iPhone, Blackberry, Windows and Android devices. They currently have over 8,000,000 users and are adding 35,000 new users every day. Over 250,000 businesses are using them. How is BITE going to use Foursquare? BITE now has its own brand page on Foursquare, located here. Simply login to Foursquare and click ‘Follow’ on our page and you will see any new tips we leave for pubs when you are out and about. We’re going to leave tips on all our BITE Premium Pubs so you know which are the best pubs to visit. Soon we hope to add a series of badges for you to collect when you check-in to pubs. Also, pub owners often run specials – free glasses of wine or a coffee between certain hours or perhaps things like 20% discount on your bar bill on your first check-in! Make sure you install the app and use it when you are next out and see what local bars are already offering you! We’ll be sending over instructions to our BITE Premium Pubs about how they can benefit from Foursquare soon.